The composer, Johann Sebastian Bach, known for sacred and secular works for choir, orchestra and solo performances, loved coffee so much he wrote the “Coffee Cantata” and immortalized the drink in the song “How sweet coffee tastes! More beautiful than a thousand kisses, sweeter than muscatel wine!” and he also wrote: “Without my morning coffee, I’m just like a piece of roasted goat fat.” How he would have enjoyed sitting in a Moroccan cafe. For, despite the fact that many people associate Moroccans with mint tea, it is coffee drinking that plays a major role in Moroccan social and business life. Yes, mint tea is refreshing and yes, it is probably the subject of more tourist photographs, but Moroccans drink far more coffee. And Moroccan coffee is superb. 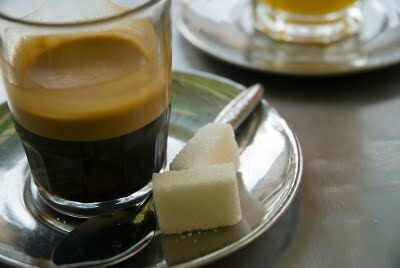 Take a stroll past a café anywhere in Morocco and your will see coffee drinkers taking their time over an espresso. The time thing is interesting. 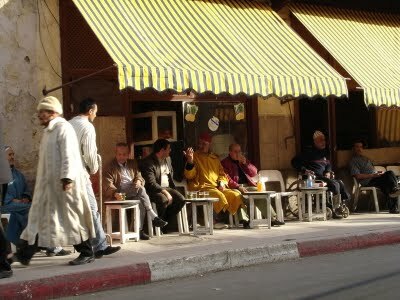 The French or Italian habit of a quick caffeine hit, standing at a bar, on your way to work, is not the Moroccan way. Here a single espresso can be sipped for an hour while the day’s business is got underway. Sit for a while and you will see that the café is also the “office” from which enterprises are run. The first impression – that of men simply wasting their time in the café – is wrong. Business is being done. People come and go, delivering messages, parcels and money. While the café is still a mainly male domain, this, like much of contemporary Moroccan life, is changing. Women tourists have broken down the stereotype and their Moroccan sisters have been quick to follow their lead. On a recent trip to the beautiful town of Moulay Idriss, almost thirty percent of the café crowds were women. The upper terrace rooms of most cafés were traditionally the preserve of women, but now they are moving down through the “glass ceiling”. A casual observation would suggest that the women coffee drinkers tend to drink “nus nus“, the half-half milky coffee that men might only drink first thing in the morning. The sight of a Moroccan women having a cigarette with her espresso is still rare in the more conservative cities such as Fez. But Marrakesh? Casablanca? Here coffee drinking democracy is in full force. If making a great cup of coffee is a barista’s art, then Morocco is a land of artists. The coffee in many instances is Arabica grown in Côte d’Ivoire. But the best coffee in Morocco is more than simply a good bean well roasted. For the connoisseur there is spiced coffee. In the souqs of Morocco are small stallholders making a living selling coffee and spices. For thirty dirhams (about $3.50) you can purchase half a kilo of Arabica beans that are then ground with a mixture of up to nine spices. These include; nutmeg, black pepper corns, cassia (Cinnamon) bark, sesame and cumin seeds. One of the delights in drinking this spiced coffee is that each shop seems to have a slightly different mixture. Given the quality of Moroccan coffee, it seems surprising that the large coffee chains should make an inroad into Morocco. Imagine our surprise to find a Facebook page entitled “Bring Starbucks to Morocco!! !” (their exclamation marks, not ours). The group has 450 members all keen to drink fancy coffee. And, even more surprising, the founder of the page claims links to the World Health Organisation. Of course, Starbucks is an acquired taste, but it is a world away from a real Moroccan coffee in both taste and cost. Then there is the health issue. According to France’s le Post, “Un cappucino frappé qui équivaut au quart de la ration calorique d’une femme en bonne santé, c’est possible chez Starbucks. Sur lefigaro.fr, on apprend ainsi que le Frappuccino en version 50 cl, produit phare de la marque, contient entre 450 et 550 calories en moyenne. Colossal.” You do not need to understand French to comprehend that 550 calories is… is, er… well, “colossal’! And if Starbucks wasn’t enough, the latest news from the coffee front is that the Canadian retailer, The Second Cup Coffee Company, has plans to open four new locations in Morocco Mall, Casablanca, with its regional franchise partner, Groupe Amarg, in pursuit of its global expansion plans. The Morocco Mall is also a Starbucks site. Second Cup International president Jim Ragas said the new locations are scheduled for opening in the Morocco Mall in October, 2011. “Second Cup believes that having strong local owners as operators is instrumental to delivering a superior guest-experience,” Ragas said. According to Groupe Amarg, the Second Cup experience will cater to the Moroccans who are looking for a premium café experience driven by value. The coffee retailer’s international expansion, which started in 2003, has opened cafés in Dubai, Abu Dhabi, Syria, Jordan, Bahrain, Qatar, Oman, Saudi Arabia, Egypt, Kuwait, Turkey, the US, Cyprus, Romania and Lebanon. The company offers espresso-based beverages and iced drinks, signature foods, indulgent treats and premium beverages. We suppose they will also have spiced coffee. While it is certainly right that Moroccans can choose to have any kind of coffee they like, what is sad is that many visitors may head for the familiar chains and miss out on a cup of real Moroccan coffee in a street café. It is a bit like visiting Morocco and only eating at McDonalds. We could go on, but right now it is time to head to the café for a nus nus. Oh, and it will only cost me five dirhams.